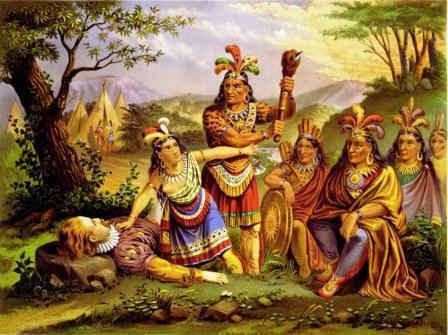 Powhatan Wars Summary and Definition: The Powhatan Wars were a series of three wars fought between English settlers of the Virginia Colony, and Indians of the Powhatan Confederacy. The First Powhatan War was fought 1609 to 1614. The Second Powhatan War was fought 1622 to 1632. The Third Powhatan War was fought 1644–1646. Note: The colonists are referred to as English up to 1707 when the union between England and Scotland created Great Britain and the term British is then used. This short History Timeline of the Powhatan Wars provides fast facts and information about the history, years & dates, key events and famous people who fought in the Powhatan Wars. 1607: Fall / Winter : More than half the colonists die from disease and of starvation. A few Colonist die from wounds caused by Indians. 1609: Tensions between the Indians and colonists rise when livestock, owned by the colonists, are allowed to wander into the Indian cornfields. 1609: 1609 - 1614.The Powhatan reduce trade attempting to starve the colonists out and attacks are made on the fort and the First Powhatan War erupts. The period covering the next 2 years (1609-1610) would become known as the 'Starving Time'. 1621: Sir Francis Wyatt (1588–1644) is appointed English governor of Virginia. 1644: Opechancanough mounts a terrifying attack, designed to move the colonists from the Powhatan land, killing 500 colonists. 1645: August: Governor William Berkeley stormed Opechancanough's stronghold and captures and imprisons him. All other captives are sold into slavery during the Powhatan Wars. 1646: The new Powhatan chief, Necotowance, signed the 1646 Peace Treaty. The result of the Powhatan Wars was a boundary, or racial frontier, between the Indians and English lands that could only be crossed for official business with a special pass. 1646: The situation following the Powhatan Wars lasted until 1677 and the Treaty of Middle Plantation which established the first Indian reservations following Bacon's rebellion.